Simple and easy way to integrate Facebook leads, helping you to sync leads from multiple Facebook Lead Ads directly to your leads panel and CRM. 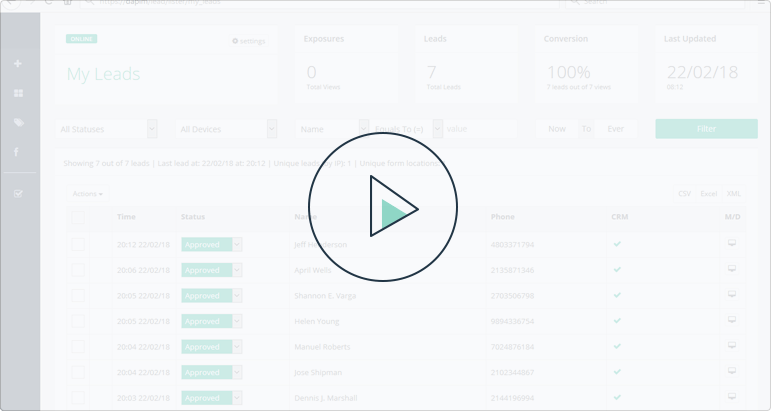 CRM Integrator will report your leads in GET, POST, WebService, or with a specific email format, and includes an error reporting and a separate feedback status for each lead to ensure acceptance. Tagging feature makes it easier to manage multiple campaigns and clients, allowing you to filter, search for, and set different permissions for your clients, campaigns, or any other group you desire. Choose from our top 5 layouts for maximizing leads conversion with an adjustable look & feel in colors, fonts, and texts. Our supporting UTM sources and query string parameters, as well as our collection of user metadata, such as IP address, user agent, browser language, and resolution, help to optimize and improve campaigns results. Use your Google Tag Manager account to add forms to a landing page or a website and to enhance your control of your leads forms appearance. You can get more! For higher quotas and fewer limitations - contact us for custom plans. No, Hover Lead is a fully hands-off solution. Our service is specifically built for people with no programming skills, so that you can add forms to your landing page or website as easy as “copy & paste”, or by connecting your form with your Google Tag Manager, which only takes a few clicks. No, Hover Lead does not save your payment information. All payments are transmitted securely directly to the certified payment operator. We do not save your credit card number or any other sensitive information in our database. For auto-renewal purposes, we may save only a token string as a key provided by the certified payment operator. Yes, you can upgrade your current plan by clicking the “Upgrade” button in the left bar or through your user account. Yes, after payment approval, we will send you an invoice to your email. In addition, you can download a copy from your user account in the “Billing” section. For security and stability reasons, we have chosen Google Cloud Platform as our infrastructure for Hover Lead. This means that all of your information, including your client’s leads, will be hosted on Google Cloud Platform, which stands in the highest security specifications. Hover Lead is working under GDPR (General Data Protection Regulation) by which the European Parliament, the Council of the European Union, and the European Commission intend to strengthen and unify data protection for all individuals within the European Union (EU). When you or your client sends Hover Lead information, such as your account credentials or leads from a website, we always use HTTPS protocol when it is enabled. Hover Lead uses Google as the Certificate Authority for providing a secure communication between users to our application. We have found Google to be the most trusted and reliable source for our users.